The PTI has no future in Pakistan’s politics unless a major change arises in the party’s political priorities. On September 3, Imran Khan, the chairman of the Pakistan Tehreek-e-Insaf (PTI) party, while addressing a protest rally in Lahore, demanded the resignation of Prime Minister Nawaz Sharif for consistently failing to address opposition parties’ concerns regarding the Panama leaks issue. Ever since the scandal became public, revealing the Sharif family’s offshore activities, opposition parties have demanded that the government should include the names of Sharif’s children in the investigation because of their alleged involvement in the illegal transfer of funds abroad. So far, the government has resisted the opposition’s onslaught. The PTI has promised to launch another long march, reminiscent of the 2014 sit-in in the country’s capital, Islamabad. This time, however, Khan’s party has planned to march towards the private residence of Sharif’s family. Over the last couple of months, tensions have brewed between Sharif’s political party, the PML-(N), and PTI. A week ago, the National Assembly speaker, who is also a member of the ruling party, dismissed PTI lawmakers’ corruption-related motions seeking to disqualify the prime minister. In response, the speaker took a jab at PTI’s chairman: After the PTI lawmaker’s request for Sharif’s dismissal as the country’s prime minister, the speaker sent a reference to the Election Commission of Pakistan (ECP), recommending that Khan should not be allowed to work as the member of the NA due to his own involvement in the corruption scandal. The persistent sense of urgency on Khan’s part to continue the politics of agitation is due to two reasons. First, during the last general elections in 2013, PTI’s popularity and support base were at an all-time high. After the elections, the party emerged as a mainstream political party after winning the third-highest number of seats in the parliament. Moreover, the party also managed to form a government in the province of Khyber Pakhtunkhwa (KPK). Since then, however, the party’s popularity has declined sharply and as a result it has slowly lost its electoral base. Moreover, in an electoral context, the party has not been able to attract any major electoral heavyweights as potential winners across the country. Khan believes that by continuing the politics of protest and giving voice to the issues of corruption and bad governance, he can still muster the necessary support to win the next general election. However, Khan’s current unscrupulous and vicious political maneuverings are only going to isolate his party further. His opportunistic political decisions and alliances, and willingness to join hands with the military to weaken his political opposition has shredded his credibility and standing, which had been his most important political asset. In this regard, the drastic decline in public interest for the PTI’s protest calls reflects the inevitability that the masses will neither approve nor appreciate Khan’s unbridled methods of employing street power to destabilize the government to settle personal scores. Even the Pakistan People’s Party (PPP), which has also called for the accountability of the Sharif family, has refused to support or endorse Khan’s march on the prime minister’s private property. Most likely, Khan’s ‘Raiwind march’ is not going to enlist the support of any major political party. Despite meetings with a number of political and religious parties in this regard, the PTI’s leadership has failed to convince the opposition of its plans. Moreover, Jamaat-e-Islami (JI), which is in a coalition government with the PTI in KPK, has refused to throw its weight behind Khan’s ‘Raiwind march’ movement. Second, while it is evident that Sharif’s party is likely to win the next general election, the PTI’s provincial government in KPK has not shown any remarkable progress with respect to good governance to convince Punjab’s voters of its relevancy to gain any substantial share of the PML-(N)’s vote bank there. Moreover, the slowly improving security situation across the country and a reduced energy crisis in the run-up to the elections in 2018 due to number a of mega power projects that are being installed in Pakistan as part of the China Pakistan Economic Corridor (CPEC) project will directly benefit Sharif’s party. Meanwhile, the military has no interest in destabilizing the civilian regime, for it has already removed any semblance of civilian control over all strategic affairs related to security and defense. The objective behind Khan’s promotion of violent political ideas is twofold. First, by triggering mass violence, Khan is hoping to force the military into action, for he believes that such a scenario can bring him to power. Second, while he represents a political organization, he doesn’t believe that the traditional political processes can add any more constituent power to his party. For the last three years, the PTI leadership has only been focused at finding issues that can resonate with the mass public in order to add some legitimacy and life to the party’s street politics. The PML-(N)’s leadership, on the other hand, is vigilant not to give any more reasons to PTI to continue its protest politics. For better or worse, with the elections drawing closer, Khan doesn’t believe that he can afford to give up on the issue of the Panama leaks, because that is the only major issue that he can take into the next election campaign as a major campaign agenda item. The PTI’s philosophy of pursing justice has clearly gone bankrupt. Ideologically, the party’s political massage has become so extreme that it cannot even sustain the support of its own loyalists and voters. With all these dilemmas, unless a major change occurs in the party’s ideology, the organization’s future seems bleak. 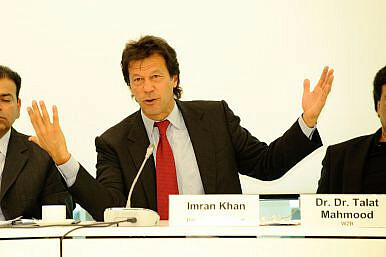 Imran Khan may have crossed the line with his latest critiques of the Pakistani prime minister.